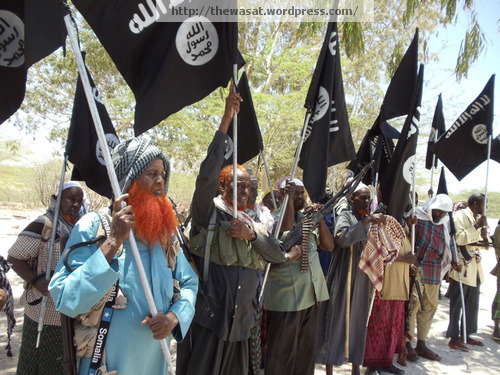 The Somali insurgent movement Harakat al-Shabab al-Mujahideen (Movement of Warrior-Youth; Al-Shabaab), as I have written previously, maintains a complex relationship with Somalia’s important clans, a relationship about which little is known. In early March the movement announced that clan leaders had rallied in support of its defensive fight against a new offensive, launched in mid February, by the African Union Mission in Somalia’s (AMISOM) military forces along with Somali Transitional Federal Government (TFG) soldiers and militiamen from the Sufi armed faction Ahlul Sunna Wal Jamaacah (Jama’ah) that is aligned with AMISOM and the TFG. 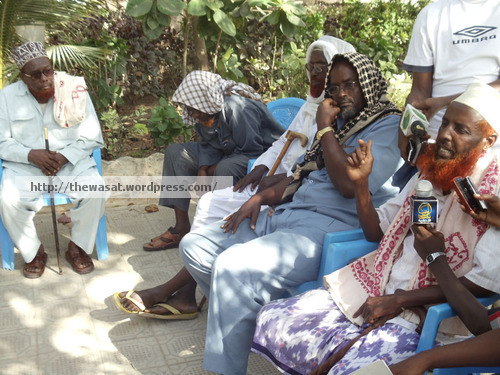 Harakat al-Shabab announced two days ago that some of its senior leaders in the district of Banaadir, in which the embattled capital city of Mogadishu is located, had met with clan elders from the Mudulood, a large sub-clan of the Hawiye clan confederation in Mogadishu. A brief report about this meeting was issued by the movement as a press release and was reported by some Somali news web sites, some of them sympathetic or aligned with Harakat al-Shabab. The movement also released photographs from the meeting, something that it often does when reporting important events. 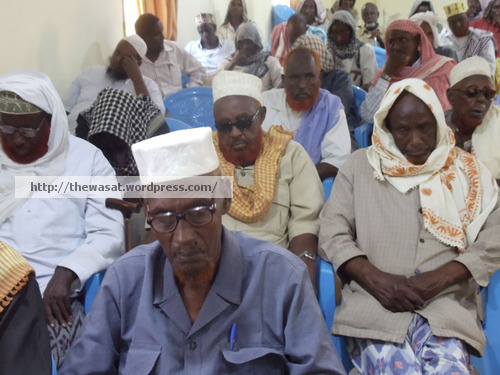 The meeting was chaired by veteran Somali Islamist leader Hasan Dahir Aweys and Husayn ‘Ali Fidow (Xuseen Cali Fiidow), a senior Harakat al-Shabab leader in Banaadir, and took place in the northern suburbs of Mogadishu. 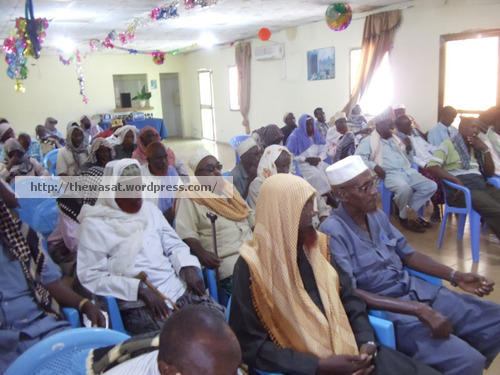 The movement’s press release claims that Mudulood clan elders (shown throughout this post) pledged their support in fighting against the foreign forces of AMISOM. 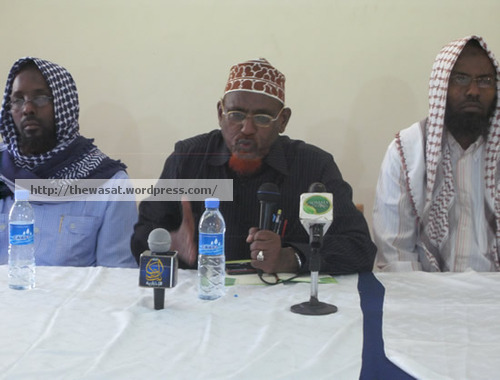 Fidow is a representative of Harakat al-Shabab’s Office of Politics & Districts (Maktab al-Siyyasah wa al-Wilayaat). 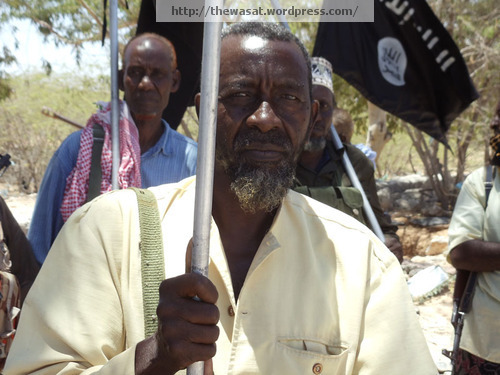 A longtime insurgent leader, he was featured in the June 2010 Harakat al-Shabab video “The African Crusaders” and has been present at a number of the movement’s recent events in Banaadir. 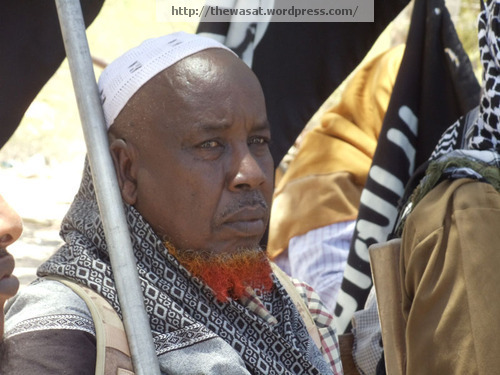 Aweys, the former leader of Somalia’s other prominent Islamist insurgent movement, Hizbul Islam (Islamic Party; Hizbul Islami), has been taking a more prominent public role over the past one to two months. Following the “merger” of Harakat al-Shabab and Hizbul Islam, more accurately seen as an incorporation of the latter by the former, in late December 2010 it seemed that Aweys had been marginalized, though he was still trotted out because of his value as a symbol. A veteran of Somalia’s two decade-long civil war, he is widely respected by many Somali Islamists. 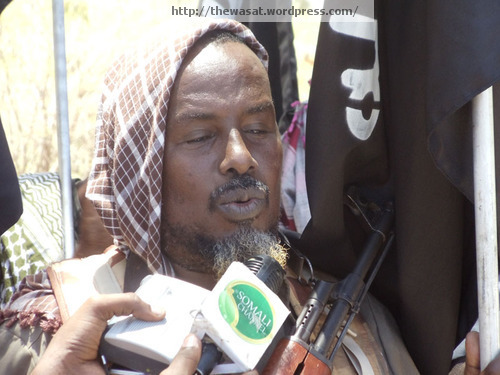 Although the exact nature of his role within Harakat al-Shabab remains unknown, Aweys has been increasingly active, if the movement’s own media is accurate, in its public events. He has been present at a number of high profile press gatherings alongside ‘Ali Mahamoud Rage (‘Ali Dheere), Harakat al-Shabab’s senior spokesman, including one where a Burundian AMISOM prisoner was paraded before cameras. Aweys has recently been referred to as “a leader” within the insurgent movement in its press releases, though this general title does not shed much light on what precise role he is playing. 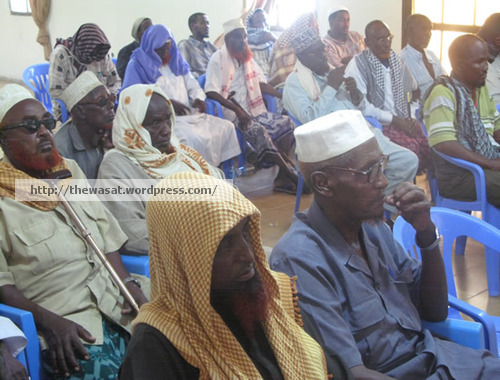 This meeting between Harakat al-Shabab officials and Mudulood clan elders comes at a time when the insurgent movement is facing pressures on the battlefield. AMISOM, TFG, and Ahlul Sunna forces, reportedly aided by the Kenyan and Ethiopian governments, have captured territories in Banaadir and Gedo. The timing of the meeting suggests that Harakat al-Shabab is using clan ties during its most serious time of crisis in quite some time. However, the movement has in the past maintained relations with clan leaders, despite its criticism of “clannism,” and has even mediated disputes in the past between rival clans. Insurgent primary sources must be used with care. They must be analyzed while keeping in mind that they contain strategic framing, in short an attempt to portray the movement and its inner workings in a manner that is flattering. This does not mean, however, that these primary sources are necessarily completely or even mostly false. In the absence of the ability to conduct on-the-ground fieldwork and other sources, insurgent primary sources provide valuable insights on the movement and, to a degree, events on the ground in territories it controls. The relationship between Somalia’s powerful Harakat al-Shabab al-Mujahideen (Movement of Warrior-Youth) insurgent movement and the country’s socially and politically important clans remains the subject of uncertainty and great debate among scholars and analysts. Movement leaders have consistently downplayed and criticized “clannism,” defined here as loyalty to one’s clan at the expense of religious (Muslim) identity. Criticisms of clannism are particularly poignant following decades of civil war in which clan loyalties and warlordism have often played a destructive role. Harakat al-Shabab‘s ideology, which is a militant version of Islamism, has reportedly brought together individuals who are Somali religious-nationalists (or pan-Somali) and those more invested in borderless transnational militancy akin to Al-Qa’ida Central’s (AQC). Exact details and verification of reports coming out of Somalia are very difficult to verify because of the extreme dangers and difficulties involved in doing fieldwork or culling any information and date from on-the-ground interviews and ethnographic observation. Many of the news sources, both in Somali and other languages, are biased toward one side or the other and are not always reliable. Officials and news sources close to the weak Transitional Federal Government (TFG) or the African Union Mission in Somalia (AMISOM) and the insurgency, such as Radio Al-Furqaan, are valuable sources for the study of propaganda and media framing but are not very useful for gathering “unbiased” (or as much as possible) information about on the ground developments. Unconfirmed reports that there is a split among Harakat al-Shabab‘s leadership have persisted, despite public denials from some of the individuals involved in the continuing drama. 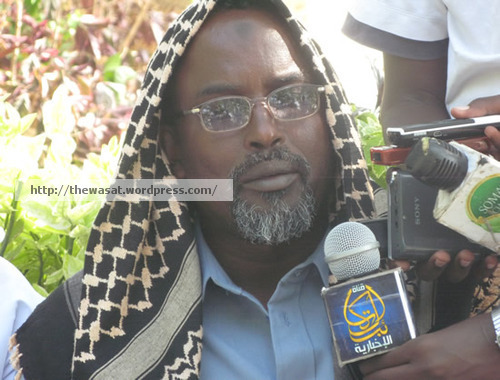 In short, the movement’s senior leader (amir), Ahmed “Mukhtar Abu’l Zubayr” Godane is reportedly on the outs with some of its more religious-nationalist or, perhaps more accurately, Somalia-centric commanders and officials, chief among them the popular Rahanweyn leader Mukhtar “Abu Mansur” Robow, Harakat al-Shabab‘s senior spokesman, ‘Ali Mahamoud Rage (‘Ali Dheere), and popular movement preacher Fu’ad Muhammad Khalaf “Shongole.” The latter group’s discontent is said to center on three major issues: (1) Godane’s favoring of members of his own clan, Isaaq, (2) his move toward the far right, in line with more transnationally-minded foreign members in command positions within Harakat al-Shabab, and (3) discontent following the heavy losses suffered by the movement’s armed wing, Jaysh al-‘Usrah (Army of Difficulty/Hardship), in a failed Ramadan 2010 offensive last autumn. In December the Puntland-based Somali radio station and news web site Garowe reported that both Shongole and Robow had criticized Godane following the Ramadan offensive. Shongole was reportedly particularly critical of the killing of Somali civilians during the offensive. Clan dynamics may also be at play in any internal conflict. Robow (Rahanweyn) and Rage (Murasade/Hawiye) come from clans that anecdotal evidence suggests are the clans that many of Harakat al-Shabab‘s fighters come from, particularly in the administrative district of Banaadir and the capital city of Mogadishu, which is in Banaadir. This may be preventing Godane and their other internal rivals from attacking them more directly for fear of losing a large number of Rahanweyn and Murasade/Hawiye fighters. 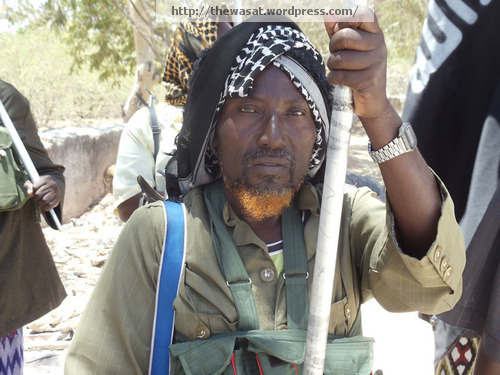 Reports emerged last year that Rahanweyn clan elders were becoming increasingly unhappy with supplying many of the frontline insurgents while not having any significant clan member in Harakat al-Shabab‘s leadership besides Robow. These reports are very difficult to concretely verify. Public denials of a split are likely issued to stem the spread of reports of internal discord. Although reports of a split(s) may be exaggerated there is a good deal of evidence, much of it admittedly anecdotal, that the split(s) are real and likely to continue growing. Harakat al-Shabab will likely split in the future, though its future depends a great deal on the outcome of AMISOM’s recent military offensive, which is being aided by the Ethiopian military, TFG forces, and a pro-TFG Sufi militia, Ahlul Sunna wa’l Jama’ah. The TFG’s president, Sheikh Sharif Sheikh Ahmed, has already claimed that an AMISOM/TFG victory is near, though this is likely gross hyperbole. What is entirely probable is that Harakat al-Shabab has suffered heavy casualties, though claims of actual numbers, in the hundreds, from AMISOM and the United Nations are difficult to verify. At least 53 AMISOM soldiers and an unknown number of TFG and Ahlul Sunna members have been killed since the latest “offensive” began on February 25. 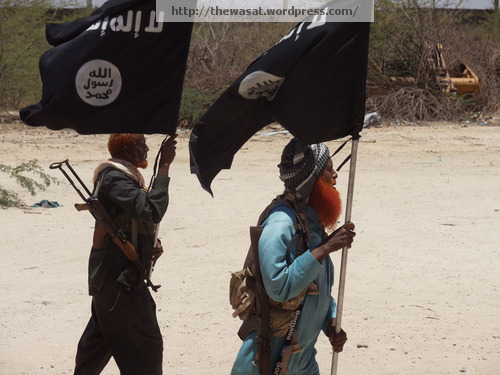 Statements from the Harakat al-Shabab itself and affiliated news sources including Radio Al-Furqaan, have reported that the movement is recruiting more fighters to send to the frontlines of Mogadishu. 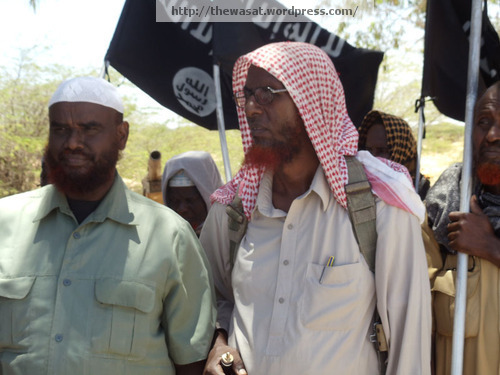 Harakat al-Shabab‘s rhetoric with regard to the country’s clans has been careful. Despite its general criticisms of clannism the movement has been careful not to directly attack specific clans, particularly in contested districts such as Banaadir. 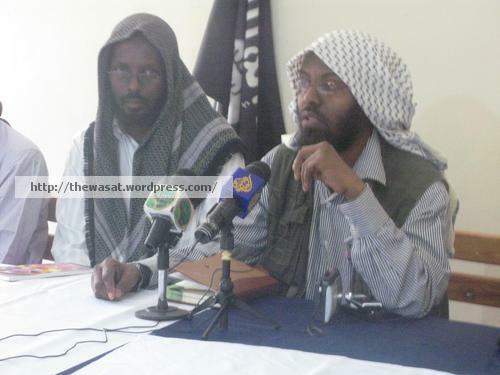 The movement’s leaders have also engaged with the clans at certain periods of time, even mediating inter-clan disputes according to Harakat al-Shabab‘s own press statements. 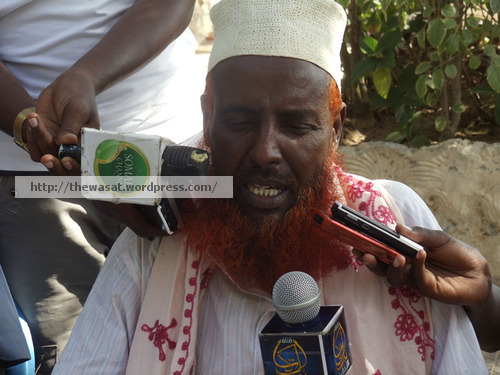 Leaders such as Robow have also reportedly maintained good relations with clan leaders (he is supposedly popular with Hawiye clansmen and elders). In response to the recent AMISOM/TFG/Ethiopia/Ahlul Sunna offensive, Harakat al-Shabab began reporting that it was being supported by clan leaders from around the country. These reports emerged first from news sources close to the insurgency, such as Radio Al-Furqaan and Somali Memo, and have since been “confirmed” by Harakat al-Shabab itself in a statement. Despite its criticism of clannism, the movement’s statement claims that clan leaders from around the regions of central and southern Somalia that it controls have “flocked to the capital Mogadishu” in order to support the defense against the “crusaders” (AMISOM) and apostate government (the TFG). These clan leaders pledged their support and intent to participate in the defense of the “Islamic wilayaat ” (meant in the sense of “districts” or “provinces”) from the campaign of the “crusader forces” backed by the “government of apostasy.” The emphasis on the leading role of AMISOM, a foreign force composed of Ugandan and Burundian soldiers, is key in terms of message framing. 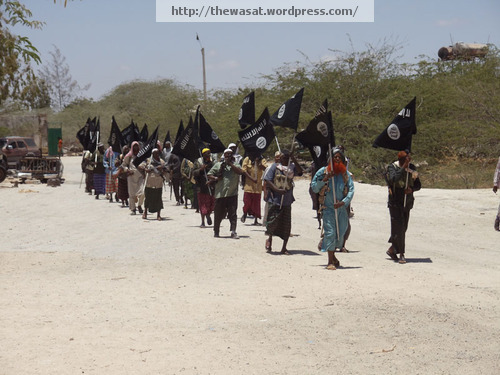 Some of the photographs released by Harakat al-Shabab are interspersed throughout this post. The clan leaders are carrying the black-and-white flags emblazoned with the Muslim testament of faith, “There is no god but the [One] God and Muhammad is His Messenger,” used by the insurgency. There are two possible interpretations: (1) Harakat al-Shabab, when facing a difficult military setback, is relying, perhaps against its will, on established clan ties, or (2) the movement is emphasizing that it represents pan or “post” clannism. Specific clans represented in this “procession” of support are not identified, which is noteworthy: No one clan is being singled out. There is no question that AMISOM is technologically superior to Harakat al-Shabab. However, AMISOM and the TFG in the past have regularly lost ground gained, usually measured in dozens to scores of meters rather than miles, to insurgent counterattacks. The failure to establish defensible lines capable of holding newly-gained ground is likely to lead to the same result. More importantly any military gains will ultimately be for naught if the TFG continues to be a corrupt, inept institution that has almost no legitimacy on the ground inside Somalia. Reports of Ethiopian involvement in the current fighting is not likely to gain the TFG and President Sharif any fans inside the country. Rather, the AMISOM-led campaign clearly shows that the TFG remains unable to exercise authority even within the whole of the capital city of Mogadishu. Long-term progress and stability is reliant on real reform of TFG institutions, which is unlikely to occur. The decision by the TFG’s parliament to renew its own mandate, despite having not made any real progress, was criticized publicly by elders from the powerful Hawiye clan confederation, the dominant clan group in Banaadir and Mogadishu. It remains clear that, as I have argued previously, neither the TFG nor Harakat al-Shabab have succeeded in achieving true legitimacy among the Somali people. Further, clan dynamics are likely to continue to play an important role. Similar to the original premier Somali Islamist movement, Al-Ittihad al-Islami (Islamic Union), Harakat al-Shabab is unlikely to be able to remove them as a factor in the country’s politics. If the insurgency succeeds, though its chances are slim, it would be a significant accomplishment that will be one of the most significant events in Somalia’s modern history since the early 1990s. 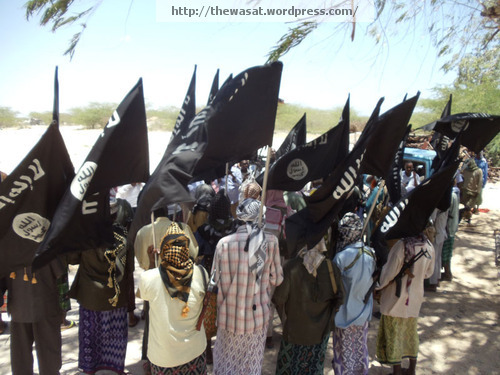 It is more likely, however, that Harakat al-Shabab will split along ideological and possibly clan lines.